This is the first glimpse of Prince Harry and Meghan Markle's floral tribute to Princess Diana. 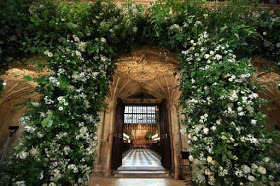 St George's Chapel, in Windsor, has been adorned with floral displays ahead of the couple tying the knot. The first pictures from inside the historic building show foliage, white peonies, white garden roses and other white blooms adorning the front of the organ loft, towering above the seats. The flowers were a favourite of Harry's late mum. A central arch will serve to frame the royal couple as a congregation of family, friends and well-wishers watch them take their vows. 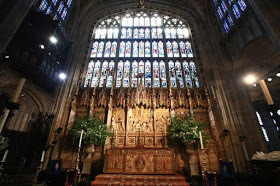 Two large arrangements also sit either side of the High Altar in the Windsor Castle chapel. 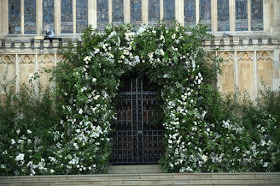 The display, which also features foxgloves with branches of beech, birch and hornbeam, also extends to outside the chapel, lining the West Steps and surrounding the West Door through which Meghan will enter the church. The display has been carefully crafted by floral designer Philippa Craddock. This morning it was announced Prince Harry and Meghan Markle will be known as the Duke and Duchess of Sussex as the prince prepares to marry his American bride in a glittering ceremony watched around the world by millions.